I love this time of year. Besides spring, fall is the best. There’s something about watching the leaves change color then fall leisurely to the ground that fills my soul with certainty—the certainty that no matter how cold and harsh winter gets, next spring the trees will burst forth with new leaves and the world around me will start a fresh new beginning. I feel the same way about my writing. As I start a new story it’s very much like spring. The characters or setting or circumstances—maybe all—are new and fresh. Even if the new story is the next book in a series with the same characters and the same setting, those characters are getting a new beginning to change some aspect of who they are or how they react to a situation. Writing the story is like opening presents at Christmas, I never know what might be coming in the next few pages. My characters are always surprising me. When I finally reach the end, I feel both exhilarated and exhausted. I feel truly blessed that I am able to write the stories I love and publish them. When I was a little girl I dreamed of writing books and movies. I started trying almost as soon as I learned how to write. I spent most of my free time telling stories to my family and friends. I always had a story I wanted to tell but it would be many years before I would pursue writing as a career. I am so very thankful to have achieved that goal. This time of year makes me more keenly aware of how blessed I am. It also reminds me that the best way to show my thanks is by giving. On Saturday I learned of an elderly homeless man who had been coming into a thrift store looking for used coveralls to help him stay warm this winter. The owner, a friend of mine, told me the man had been coming into the shop several times a week asking this same question. I knew what I had to do. I hurried to the Tractor Supply store and bought the best pair of insulated coveralls, gloves, socks and headwear I could find. My friend helped me find the man. Seeing his ragged pants and jacket and cold, bare hands made me want to cry. I gave him the things he would need in a nick of time. This week we have had our coldest weather of the year. I know what I did wasn’t much but it mattered a great deal to one man. So, I challenge you—all of you—if you can help just one person this holiday season, please do. It will make a difference. Give thanks in a way that counts. Buy someone who needs it a coat or a hot meal. I wish you all a happy Thanksgiving and a merry Christmas. Be safe and enjoy! 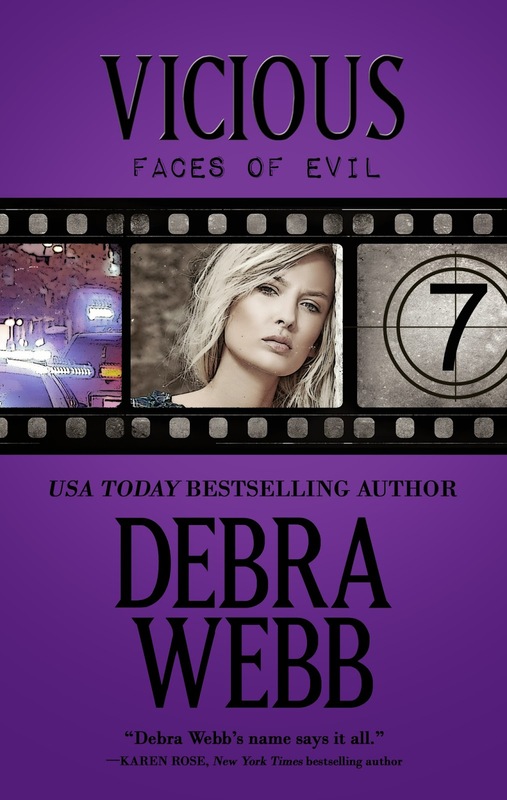 If you have a chance, look for my latest release in the Faces of Evil series, VICIOUS. It’s available in paperback and digital exclusively at Amazon. You might also enjoy SILENCE, the Christmas prequel set ten years before the series began. Be sure to check out Debra's giveaway in the JRS SHOWCASE! I have been enjoying this series Debra. How many do you have planned? Thank you, Janet! There will be 12 books in the Faces of Evil series and maybe a spin off series coming! You gave that man more then just warm clothes to wear, you gave him another reason to be thankful tis year... he knows he is not forgotten and there is still kindness in this world. Thank you for being you. I understand knowing what you wanted to do for your living as a young child, mine was to be a vet from the age of 9. I love the whole series and am enjoying Vicious and look forward to Vile. Thank you, Dr. Linda! You are a blessing to our beloved four-legged friends! An excellent blog and appropriate for this season, but throughout the year! Your act of kindness does not surprise me because you are a wonderful person. It doesn't matter how much or little that you have financially, everyone can do small acts of kindness, such as, buying a meal for a homeless person on the street, even it's fast food. I always ask what they would like. Many places have programs where you can donate an old coat in good condition, supermarkets take donations to pass food on to food banks, and churches always will help others out. Sometimes a smile and kind words to someone less fortunate is great, if that is all you can afford to give. Now, to the Faces of Evil series, I love this series and Vicious Book 7 ups the notch in this fantastic series!. The Faces of Evil series is the perfect balance of Romance and Suspense. You will definitely love the recurring characters and their stories, especially former and current lovers, Jess and Dan! If any of you have not read this series, I guarantee that once you read Vicious, you will go back and read the first six books of this great series! While you are getting Vicious, do yourself a favor and buy Obsession, the first book in the series, if you are new to the series. You will be hooked and it is so reasonably priced, as are the earlier six books!!! Enjoy! Happy Thanksgiving to you Deb and all followers of JRS!!! Thank you, Marijane! You are a true treasure! I think during the holidays there is so much hustle and bustle that many forget what the true meaning is of Thanksgiving and Christmas. Thanksgiving is a time for giving thanks like you said; being thankful for our many blessings because there are far too many who are without. I teared up last week reading and see the homeless man on TV here in Atlanta who found a woman's wallet that had been stolen. The thief had only taken the cash and thrown it in the trash. The homeless man was going through the trash when he found it. He searched until he found her and returned it to her. The Omni hotel has let him stay there, people have been giving donations and the Omni is providing him a Thanksgiving meal today. I'm not saying that people have to do a good deed to be rewarded but I can't imagine the difference being out of the cold has been, having food, baths, clean clothes, etc. It really touched me. The homeless man was only doing what he believed was right and I'm glad it has turned into something good for him too. We receive blessings by being a blessing and you are truly a blessing Debra. You have a kind heart and I'm so glad that you bless us with your writing skills and thoughtfulness. I've always wanted to write books because I can talk alot! But, I just don't seem to be able to tell stories. You have a wonderful talent and I've loved every book you've written so thank you for sharing your talent with us. DeeAnn, thank you so much. You are a dear person! Happy Thanksgiving, enjoy your meal. Thank you, Tracey! Same to you! Debra, I haven't read this series (The Faces of Evil), but I have read many of your Colby Agency series -- I always looked for one & when found would buy it. Guess I'll need to start reading The Faces of Evil now. Although I personally haven't done an act of kindness this season, our church will be doing a Christmas outreach in which I will take part. I commend you for your thoughtfulness in giving the homeless man exactly what he needed. Thank you, Donna! I hope you'll try the Faces of Evil. You can get seven books for under $30! The first three are still $2.99 in digital and $3.99 in paperback. Start with OBSESSION! Debra, I just wanted you to know that I really have been enjoying this series the Faces of Evil. I am wishing you have a bless Thanksgiving!!! Thank you so much, Gail! Same to you!